We missed two of our class friends today, we made du'aa for them and hope to see them back in the class with us soon. This morning we started off our day with some fun centres, followed by Quraan class with teacher Ibtissam we reviewed some of the short suras we read in JK. Today we talked about helping people who are in need, and we also talked about hajj and our upcoming Eid holiday, the students worked on their own mini-countdown to Eid worksheet that they have with them today in their backpacks. We played Simon Says in the gym, this game will helps us improve on our listening skills! 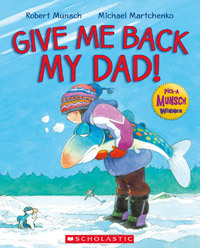 We read a silly Robert Munsch story Give Me Back My Daddy.